If you had to guess what kind of car I drive, what would you go with? Sports car, SUV, minivan? How about a full sized truck? A vehicle that was originally intended for my husband has now become mine. I drive a Ford F-150 Platinum wherever I go – school drop-offs, the vet, quick trips to the store, long road trips…it’s mine and I love it. And complete with car seats, toys, and dog hair. So when Ford invited me to join in on the Explorer Platinum Adventure Tour, I jumped at the chance! I’ve fallen in love with Ford since buying our truck in 2012 and couldn’t wait to learn more about the new Explorer. A vehicle that has topped the charts as the best selling SUV for over 25 years, with over 7 million sold, and one selling every 2 minutes. Ford outdid themselves with creating this trip. They created a multi-leg journey for journalists eclipsing over 2,700 miles starting in Vancouver, British Columbia and ending in Albuquerque, New Mexico. I joined in on this epic journey for the Calgary Stampede leg which took us from Kamloops, British Columbia through Banff National Park and ending in Calgary, Alberta. 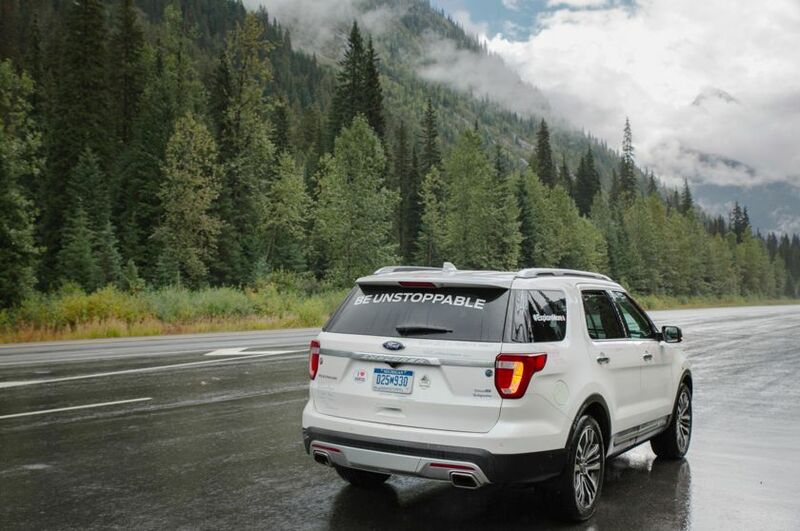 On the tour, we spent two entire days in the new 2016 Ford Explorer Platinum and got to experience what life would be like owning this vehicle in the most picturesque setting you can imagine – the Canadian Rockies. Stay tuned for my full review of the 2016 Ford Explorer Platinum and my adventures through Canada on the Explorer Platinum Adventure Tour! What features do you look for in a new vehicle? Any questions about the new Explorer I can answer in my follow up post? I LOVE my ford! How neat to get to try out the Explorer in such beautiful scenery! I can’t wait to see more pictures!